We have been learning a little about wetlands recently, and learned that there is a very unique habitat close to us. All of Nebraska's saline wetlands occur in Lancaster County. 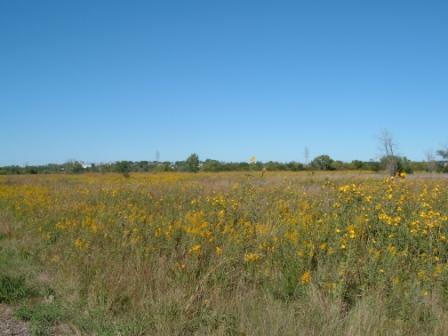 So today we visited the Lincoln Saline Wetlands Nature Center to take a walk and enjoy this endangered habitat. Of the estimated 16,000 acres of saline marshes to have once existed in this area, there are now only approximately 1,200 acres left. These areas are important stops for Nebraska's many migratory birds (we are on the central flyway, after all) as well as unique native species which are found in no other habitat within Nebraska. Yellow is definitely the dominant color of fall in Nebraska. We don't have all the maple trees I grew up with in northern Indiana and I kind of miss all the deep shades of red and orange as the leaves change. Here, it is yellow. Yellow from the annual sunflowers. Yellow from the goldenrod, which is our state flower. Yellow from most of the trees, including cottonwood and honeylocust. Even my house is yellow. 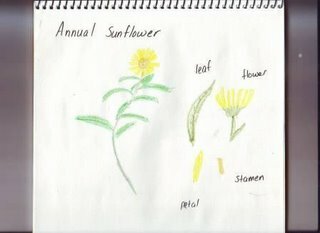 We started to do a little nature journaling, which was cut short by the sudden need of my three year old to use the restroom. 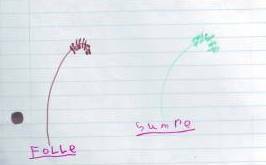 Here is as far as Mouse got on her study (as you can see, spelling does not rank high on her list of things to watch for). She chose to look at some of the grass from the native tallgrass prairie. I believe she was looking at Indian Grass. And here is the page out of my journal. I chose an annual sunflower to study. Now we would like to visit some of the other saline marshes near here as well as the more traditional alkaline marshes. We would also like to visit some more prairie lands...Nebraska has tall grass, short grass, mixed grass and a unique type of prairie covering the sandhills. I have always loved prairie grasses and we have so many little pockets right near where we live!